will participate in discussions following performances of Our Future Metropolis: Mr. D.H. Burnham Presents a Plain Talk for the Development of Chicago atLookingglass Theater Company Mon-Tue 7/21-7/22, 7:30 PM, 821 N. Michigan, 312-337-0665, $10-$25. Daniel Burnham probably never said his most famous words. We have no contemporary record of Burnham saying, much less writing, "Make no little plans, for they have no magic to stir men's blood and probably will not themselves be realized. Make big plans. Aim high in hope and work remembering that a noble, logical diagram once recorded will never die." A colleague attributed these words to Burnham after his death, and, as was reported in the Sun-Times, even the head of the Burnham Plan Centennial says the passage is apocryphal—though it sounds like something the old man might have said. The problem with these words is that they've become a political and aesthetic shield. If you want to build anything—from a high-speed rail system to a spiral concrete condo tower to an extension of the lakefront park system—you invoke them. President Obama did so proposing a high-speed rail corridor; Spanish architect Sergioantiago Calatrava and his partners did it proclaiming the merits of the now-delayed-if-not-yet-defunct Chicago Spire; the Friends of the Parks did it announcing their grand project for the lakefront. The Burnham plan has become the Leviticus of Chicago's urban-planning culture. Socially conservative biblical literalists cherry-pick their damnations from Leviticus ("Oppose the gays, they're an abomination, check. Stone to death people who eat lobster or cheeseburgers, eh, OK, we'll let that one go . . ."). Likewise the plan is invoked not on the basis of what it actually may or may not have said or of whether its pronouncements are now the right thing to do but rather to advance the agenda of the invoker. We ignore portions of the plan that are politically inconvenient or impractical or unthinkable, while acting as though anything mentioned in the plan has already been agreed upon, by every faithful Chicagoan, as a common goal. But we're in a time when we should be rethinking the plan and its mandates for the 21st century, not holding it up as scripture. Burnham and his undercredited collaborator, Edward Bennett, wrote their Plan of Chicago under the auspices of the Chicago Commercial Club and published it 100 years ago this month, in an attempt to persuade the city's businessmen, politicians, and general public that rapid and haphazard urban growth was not the inevitable expression of Chicago's exceptional energy and American ideas about private property. Instead, it threatened Chicago's continued growth and prosperity, for the overcrowded city was choking on pollution and struggling to assimilate immigrant workers. Proper long-term planning, they argued, would create a City Beautiful whose working classes would be uplifted and Americanized while its businessmen, men like the plan's sponsors, would benefit from the economies fostered by efficient transportation and happy workers. The plan included many things we now both value and take for granted as part of Chicago's urban landscape: the lakefront park system and the forest preserves; wide arteries like Western, Ashland, LaSalle, and Roosevelt; the lakefront marinas and Navy Pier. But more importantly, Burnham and Bennett, and their successors on the Chicago Plan Commission, made commonplace the idea that cities should be planned instead of just happening. In the first decades of the 20th century, thanks to the plan and the official city commission that propagandized for it, Chicago voters bought into these big ideas and voted to tax themselves to build improvements like Wacker Drive and Soldier Field. The plan's strengths—its idea of regional cooperation, its long-term thinking about transit, its consideration of aesthetics as well as practicalities—are enduring values we need to embrace as we attempt to create the Chicago of the rest of the 21st century. But a lot of the plan is now simply unthinkable, and many of Burnham and Bennett's projections are based on premises that history has proved false. They believed Chicago would have a population of 13.25 million people by 1950, and that the major modes of transportation would be walking, horse-drawn vehicles, and railroads. They proposed dozens of miles of new diagonal streets to make it faster and easier to navigate the city by those methods. Even then, these streets would have been tremendously expensive to build, thanks to the enormous amount of property that would have to be condemned. But Burnham and Bennett argued that widespread demolition would be acceptable because Chicago has "no buildings possessing either historical or picturesque value." Few people would agree today that Chicago has no buildings worth preserving. Of course Chicago did build a version of these diagonal streets: the expressway system, starting with the Eisenhower, followed by the Kennedy, the Dan Ryan, and the Stevenson. These interstates kinda sorta fit the plan's emphasis on regional transportation, and do mostly converge near Halsted and what would've been Congress Street. That's where the plan proposed a massive civic center from which the diagonal streets would have radiated. But unlike the human-scale, pedestrian-friendly diagonals the plan envisioned, connecting nearby neighborhoods more directly and garnished with plazas and promenades, we have instead high-speed highways that divide neighborhoods and facilitate swift passage through the city rather than efficient movement within it. But those expressways were very big plans, and the Eisenhower was the automobile age version of the plan's vision of Congress Street as the main east-west axis of the city. So I guess we could say that the expressway system—which cost far more money and obliterated far more streets and buildings than Burnham and Bennett could have imagined— was according to the plan and so must be good. That's the logic behind the recent proposal by the Friends of the Parks to extend the 26 miles of extant lakefront landfill park with what they call "The Last Four Miles," two miles of disused and mostly industrial land on the far south side and a two-mile mix of private beaches, rocky college-campus breakwater, and street-end beaches and parks in Edgewater and Rogers Park. They assure everyone that this idea is not a stalking horse for extending Lake Shore Drive or providing new marinas and other amenities for the leisure class. No, it's a logical and inevitable expression of Burnham's commandment that "the Lake front by right belongs to the people. . . . Not a foot of its shores should be appropriated by individuals to the exclusion of the people . . ."
The estimated cost for The Last Four Miles would be in the range of $400 million. Note the almost utopian ring of "The Last Four Miles"—so close in spirit to "Space, the Final Frontier." It's a slogan that assumes the $400 million project giving us 500 more acres of bike path and soccer fields is on everyone's urban agenda, a City Beautiful climax we've all been breathlessly anticipating. Without The Last Four Miles (roughly 13.3 percent of the total lakefront) we won't be complete as a city. The Friends of the Parks proposal quotes from Burnham's apocryphal injunction about little plans, too, even though it slights the marinas and recreational boating facilities that were always central to Burnham's intentions for the lakefront. The plan can be, and always is, read very selectively. So as an urban-planning thought experiment, how about this: Instead of spending $400 million on the Friends' big plan (and we're generously assuming that, for the first time in recorded Chicago history since Jean Baptiste Point du Sable built his trading post on spec, a project will come in on time and at or under budget), what about 400 $1 million projects? Lots of our neighborhood parks are in terrible condition. What might $400 million mean to 400 neighborhood parks? Or how about spending $400 million to repave Chicago streets with pothole-resistant concrete? Doing that would improve the quality of life of more Chicagoans than 500 more acres of recreational space along a lakefront that already provides 2,000 acres of recreational space. Guess what: that particular little plan is actually in the big plan. Burnham and Bennett wrote that "the first consideration for all thoroughfares is cleanliness, which is the result of a good roadbed kept in thorough repair, and unremitting care on the part of the city cleaning department" and even specified "smooth and noiseless" pavement. But invokers of the plan don't cite its imperative to fill potholes; assiduous routine maintenance is too much the definition of a little plan. Groups that make Big Plans are like that guy working on a two-level, three-room addition to his bungalow before he's finished the basement, insulated the attic, painted the bedrooms, or fixed the leaky faucets. Of course, our generation owes a cultural debt to Burnham and Bennett. 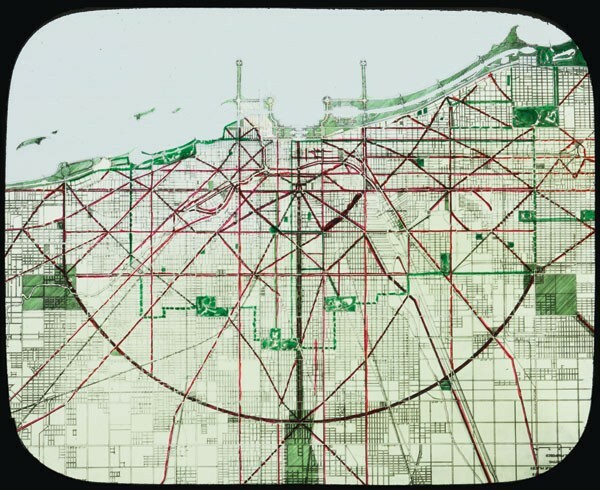 The Plan of Chicago is a great and beautiful book that helped make Chicago as magnificent as it is. But the plan is a product of its time, which is a century past. The restaurant under the Bean wins another round in its fight to avoid paying up like everybody else. Attention, CTA passengers: Mind your manners!